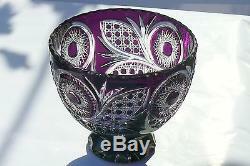 Item: BOWL / FRUIT VASE (height 21 cm - diameter 24 cm) , CASED CRYSTAL / CUT TO CLEAR OVERLAY CRYSTAL, PURPLE, New. 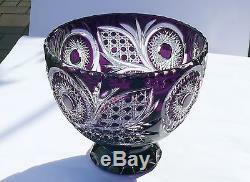 Material: cased crystal (24% lead oxide) Height: 205 mm (8.1") Diameter: 240 mm (9.4") BRAND: GUS-KHRUSTALNY, Russia. 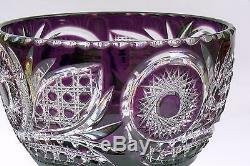 This is the finest Russian cut to clear overlay/ cased lead crystal, hand-cut and mouth-blown. It is a huge vase and heavy item. 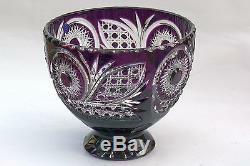 Colour is DARK PURPLE, stunning, light is playing perfectly with purple sparkles; but it is very hard to take good pictures: everything looks black and not bright. 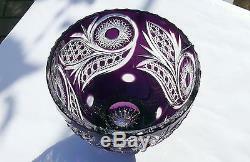 At least we tried to show the bowl in different lights. Cased crystal items look much better in reality than in photos, because photos do not show light playing through overlay and cuts. Gus-Khrustalny Crystal Factory - the Russian market leader in manufacturing of crystal, cased crystal which are rich in decor and cutting, and artistic ware. Gus - Khrustalny is "a pure Russian crystal producer" working with exceptionally Russian raw materials and fuel, and also with only Russian staff. 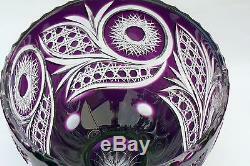 The present level of experts and artistic team training guarantees high quality of produced ware. The products of the factory can be easily distinguished by their beauty, elegance, originality and virtuosity of performance, variety of forms, colour spectrum and decor. The plant was founded in 1756 by a merchant Akim V. In 1857 the Crystal Factory was granted with permission to depict the State Coat of Arms of Russia on the produced items. 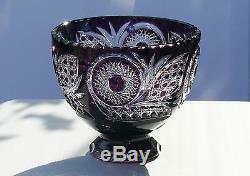 The plant executed the orders of Tsar's Court and supplied unique crystal products for the Shah of Iran. At the Universal exhibition in Paris in 1900 the Factory has won the highest prize "Grand Prix". New items are in brand new condition. All items are undergone a quality control check at the factory. Common non-damage occurrences can happen during the production of glassware, such as furnace ash, minor internal bubbles. These are not considered damage and are therefore not included in the item's descriptions. Photographs provided form part of the description. Is required within 3 days. Bank deposit can take up to two to clear. 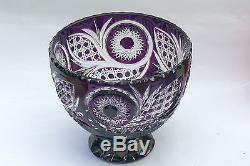 If you have a moment please take a peep at our other listed items. 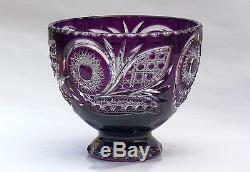 The item "Large CRYSTAL BOWL /FRUIT VASE 21x24 cm PURPLE Cut to clear overlay, RUSSIA, New" is in sale since Monday, April 13, 2015. 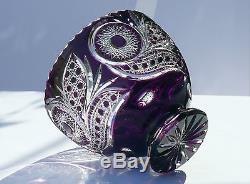 This item is in the category "Pottery, Glass\Glass\Crystal\Branded\Other Branded". 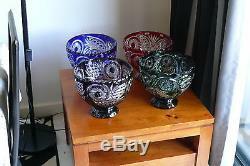 The seller is "sinchul" and is located in Richmond, South Australia.